What makes a Kalsi Seal a high-performance seal? Kalsi-brand high-performance rotary shaft seals are manufactured in a variety of designs and materials that are directed at specific application constraints and operating conditions. Although they range from direct compression seals to lip seals and packing, one feature that is common to all our rotary shaft seal designs is a repetitive pattern of hydrodynamic features, known as waves, that respond to shaft rotation by pumping a thin film of lubricant into the dynamic sealing interface between the seal and the shaft, causing the seal to hydroplane on the film. This rotation-induced hydrodynamic pumping action forces the film through the interface and produces a slow hydrodynamic pumping related loss of lubricant to the environment. Click here to see a slow-motion animation of this pumping action. Individuals tend to confuse this pumping action with pressure driven lubrication, but the interfacial lubrication of a Kalsi Seal is driven by relative rotation between the seal and the shaft. When the rotation stops, the pumping action ceases. Although the hydrodynamic waves vary in shape and aggressiveness from one Kalsi Seal design to another, they all provide the same core benefit: interfacial lubrication. This lubrication reduces friction, adhesive wear, and seal-generated heat, compared to non-hydrodynamic seals, and reduces heat-related loss of seal material strength, and other heat-related material degradation. Most polymeric rotary seals use a relatively narrow dynamic sealing interface and low interfacial contact pressure to minimize seal generated heat. The interfacial lubrication provided by the hydrodynamic waves of a Kalsi Seal allows the use of a relatively wide dynamic lip and corresponding interface and allows the use of higher modulus extrusion resistant seal materials. The wide lip provides structural strength that reduces differential pressure-related stress and deformation, making the seal more resistant to pressure-related extrusion damage. The wide lip also provides extra sacrificial material to accommodate axially acting wear mechanisms, such as extrusion damage and third body wear. Due to the wide hydrodynamically lubricated dynamic lip, Kalsi Seals® can handle higher pressure and speed combinations than other polymeric rotary seals. Pressure capacity can be further enhanced using hardware designs that minimize clearance and relative radial motion between the seal housing and the shaft. Contact us for additional information. Kalsi Seals that are optimized for high levels of differential pressure employ composite construction that places a high modulus layer of elastomer or plastic material at the extrusion gap clearance between the housing and the shaft. This construction allows the seals to exploit the favorable extrusion resistance characteristics of the higher modulus material without a corresponding dramatic increase in interfacial contact pressure. The dynamic lip of a Kalsi Seal has an abrupt circular exclusion edge that faces the environment. This edge configuration is for excluding environmental abrasives from the dynamic sealing interface. Certain seal designs also incorporate geometry that causes increased contact pressure at the exclusion edge, for enhanced environmental exclusion in certain operating conditions. Because of the lubrication provided by the hydrodynamic waves, this elevated contact pressure zone remains lubricated. Other features are included on certain Kalsi-brand rotary shaft seals for specific operating conditions. 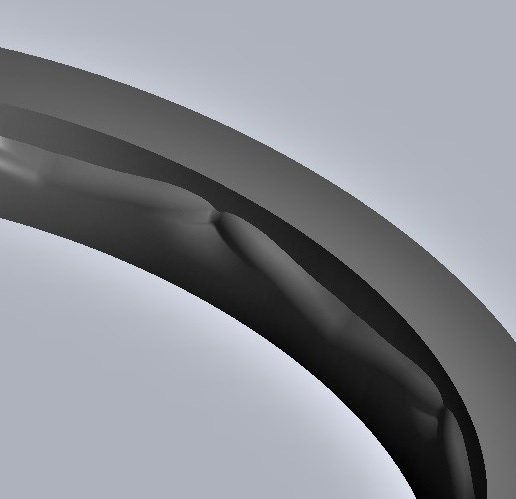 Comprehensive engineering literature and one-on-one engineering support are available to help you specify and implement the most appropriate rotary seal for the operating conditions of your equipment. We ensure the consistency and quality of our seals through extensive inspection and testing. Our quality control procedures include our certified ISO 9001:2015 Quality Management System. Let us show you what high quality and high-performance means.